Giovanni Pietro Francesco (also known in Maltese as Gian Piet) Agius de Soldanis was born in Rabat (later Victoria) the capital of Gozo (Malta's sister island) in 1712. His mother's surname was Sultana and 'de Soldanis' is probably a posh way of stating this. He was a cleric, linguist , librarian and a historian. Probably his most famous work was " Della lingua punica presentemente usata da' Maltesi ovvero Nuovi Documenti, li quali possono servire di lume all'antica lingua etrusca". It was written in Italian and published by him in Rome in 1750. A copy of the frontispiece of this book is shown alongside. It has recently been reprinted in a limited edition. 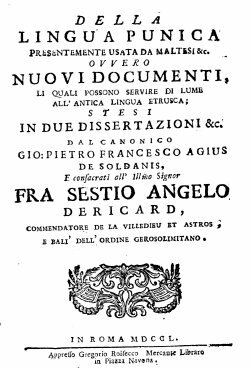 In this work Agius describes the grammar of the Maltese language and presents his hypothesis as to the origins of the language from a Punic language descended from the Etruscan. His hypothesis was subsequently soundly disproven since any similarities Etruscan may have had to Maltese were no greater nor more specific than similarities with other Semitic languages such as Hebrew, Aramaic and Arabic. However as Geoffrey Hull points out many authorities since then, besides well meaning "dilettantes", also drew invalid conclusions about the origin of the language. He was a relatively prolific writer for example about his native Gozo such as by writing the book : "Il Gozo antico-moderno e sacro-profano ...". In this wide ranging text he discusses the origin of Gozitan place names, the geography, secular and religious organisations within the island and many other facets, including the origin of surnames such as his own. Besides his main writings in Italian, he wrote in Maltese, though his Maltese-Italian dictionary was apparently never published. He also published in French, such as his involvement in a polemic regarding St Paul's shipwreck: " Discours apologétique contre la dissertation historique et critique sur le naufrage de St. Paul dans la mer Adriatique. (Avignon, 1757). Agius de Soldanis also propagated his political beliefs through his writing and this landed him in trouble on at least one occasion. Thus in Naples in 1751 he published about the unsuccessful plot of a slaves' revolt which was to have taken place two years earlier. In it he blatantly argued for rights for the Maltese, and thus incurred the wrath of Grand Master Pinto. Canon Gian Piet Agius de Soldanis is remembered in the Girls’ Junior Lyceum and Secondary School of Victoria Gozo which has been named in his memory. A short biographical account of his life is also available on that school's website, which depicts the graphic representation of him shown alongside. An excellent account of Agius de Soldanis' was given by Guze Cassar Pullicino in a presentation to Melita Historica. For other articles about Gian Piet Agius de Soldanis in 'Melita Historica' click here. A relevant text is Geoffrey Hull's book "The Malta Language Question. A Case Study in Cultural Imperialism" . Part of the information in this webpage was gleaned from or corroborated by the book, and this is gratefully acknowledged. In his book, Geoffrey Hull investigates and discusses the intricacies of the evolving attitudes towards and use of the Maltese language vis-a-vis Italian and English, in the Maltese Islands. This scholarly work addresses the complex issues in a historical, political, social and cultural context. The work focuses mainly on the last one and a half centuries during which Malta was a British Colony, yet still under considerable Italian influence. (ISBN 99909 43 08 7). An image of the front cover of this book appears alongside . Agius' contribution to the Maltese language is acknowledged online in a web page (in Maltese) about the History of the Maltese Language on the website of the 'Akkademja tal-Malti'. Although that website does not have a page dedicated to him, it has pages (in Maltese) on other scholars of the Maltese language such as Mgr Pietru Pawl Saydon.